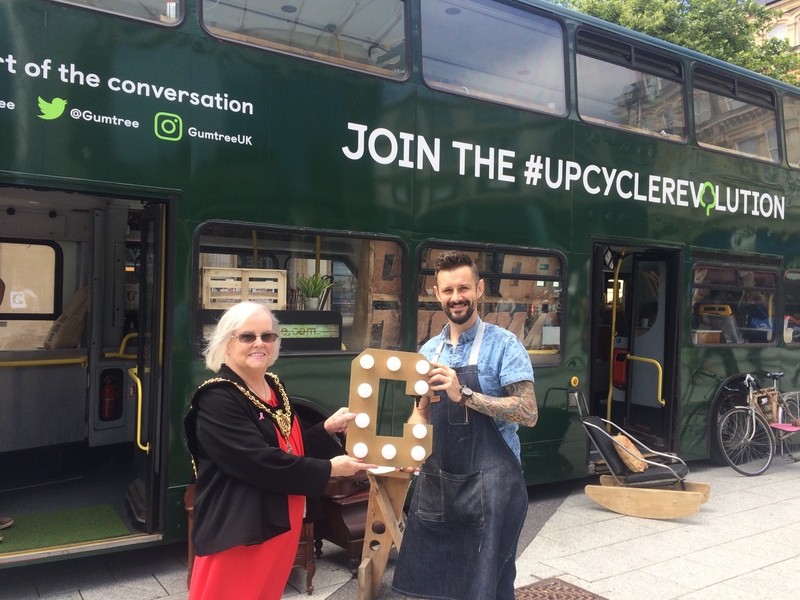 Today Cardiff’s Mayor Monica Walsh participated in Gumtree’s Upcycling Revolution bus tour in Churchill Way. She was given a full tour of the bus as well as taking part in an activity with celebrity upcycler and designer Max McMurdo of Dragons Den and Channel 4. To celebrate the second year of the Upcycling Revolution, Gumtree invites you to join the movement in London aboard its upcycled double decker bus with celebrity upcycler and designer Max McMurdo. Following National Upcycling Day on the 24th June, Gumtree will be travelling the country landing in London from 10am to 5pm to help show Londoners how to breathe new life into old materials. Hop aboard the bus and learn from Max and his team who will be teaching you how to turn old furniture into stylish and desirable items that are both functional and beautiful.